Vancouver, BC – As politicians and policy makers grapple with transit, jobs, and affordability ahead of municipal elections, an important new study offers insight into what immigrant and refugee youth think of these issues in an increasingly diverse Metro Vancouver. Commissioned by Vancouver Foundation and the Fresh Voices Youth Advisory Team, the study fills a critical gap. While 34% of all newcomers to Canada are under the age of 25, there is limited data and research on local immigrant and refugee youth communities in the Metro Vancouver area. As a result, little is known on how young newcomers experience integration and settlement. 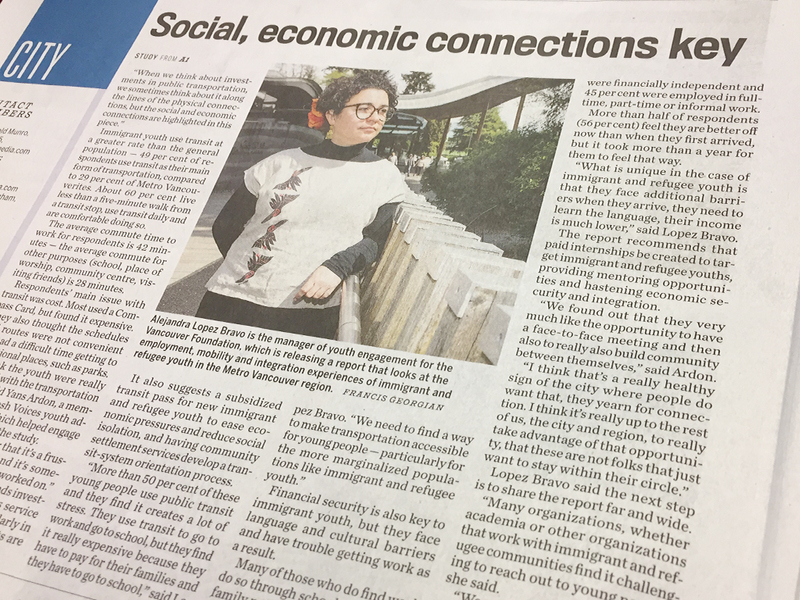 Vi Nguyen, director of Youth Engagement at Vancouver Foundation, said the study – which was peer-led by immigrant and refugee youth and carried out by researchers Celene Fung and Andy Yan – was done to provide a broad snapshot of the employment integration experiences of young people. In all, 156 self-identified immigrant and refugee youth, aged 13 to 30, participated in workshops held in seven languages in Vancouver, Surrey, and New Westminster. Tanvi Bhatia, a Fresh Voices Youth Research Assistant, credits the direct involvement of young people as not only unique, but fundamental to the project’s success. Physical Mobility: Affordable public transportation is seen as a critical element for access to education, employment, and social engagement. More frequent bus service in peak times is needed, especially in areas outside the City of Vancouver where most new immigrants settle. A subsidized transit pass for new immigrant and refugee youth would also lessen economic pressures and reduce social isolation. Economic Access and Financial Security: Survey respondents said they feel better off now than when they first arrived in Canada, but it takes time – more than a year. Because so many immigrant and refugee youth balance a full load of education, work, and family responsibilities, paid internships that provide mentoring opportunities would support quicker economic security and successful integration. Social Networks and Belonging: Rather than using technology or an internet-first approach to find jobs, immigrant and refugee youth rely on social networks from school, friends and family. Physical and institutional space for youth to nurture these networks – and form relationships outside of school or work – are very important. But government and settlement organizations responsible for creating spaces and programs need to be mindful of the multi-dimensional, layered, and complex lives experienced by these young people. One of the researchers, Andy Yan, notes, “Through this study, we’re reminded that public transportation is much more than moving from A to B, but a vehicle for social and economic integration for immigrant and refugee youth in Metro Vancouver. It is critical infrastructure that changes lives.” Yan also indicates an additional benefit of the study is the availability of the methodology and questionnaire as an open tool set for other interested municipalities. Vancouver Foundation and Fresh Voices is hosting the first of three community forums to release the findings on May 8, at 3p.m., at UBC Robson Square Theatre (C300). Subsequent forums will be held in New Westminster and Surrey.